Is the Drop in Organic Traffic Normal? Imagine if you are sick but even after consulting a doctor and taking the prescribed medications, you are still feeling under the weather. It is common and understandable that a drop in organic traffic would raise concerns about the efficacy and efficiency of your SEO campaign. There are a variety of reasons that contribute to organic traffic and it is essential to assess the multivariate environment before coming to any conclusions. One of the primary reasons is seasonal in nature whereby buyers shift their priorities in accordance to seasonality. Variations in traffic flow do not necessarily mean that there is anything abnormal about your marketing campaign. It is actually quite normal for organic traffic to fluctuate and deviate at various times of the year. If you are operating an e-commerce site, you might experience a spike in organic traffic during the Christmas period. Depending on your company’s niche or industry, or even the kind of clientele you are targeting, consumer patterns will vary according to both needs and timing. The drop in organic traffic could also be brought about by a revamp/redesign of your site. Most sites would experience a drop in organic traffic after a holiday period, and this can be attributed to the fact that Google may have delayed the update of their tracking tools. 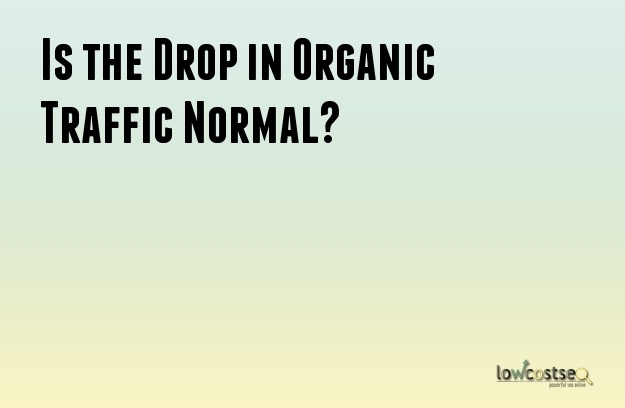 Unless the drop in organic traffic remains consistent for an extended period, there should be no cause for concern. Even though it is a concern for any online businesses to have a slump in traffic, bear in mind that this could actually be just a normal fluctuation in traffic. The continual addition of new content to your website should rectify this slump swiftly. Understanding the trends of organic traffic of your niche or industry will help alleviate any fears that your SEO campaign is failing you. You are well advised to look out for changes in the traffic trends to combat or ride the waves. Upcoming UK holidays in 2014 are bound to alter the traffic scene of your site but being aware of such a scenario will help you to leverage and embrace it. Given that it is the desire of every site owner to increase traffic to their sites, and if not maintain a consistent level, they should also understand that no keywords can control a human behaviour. Even with the abovementioned plausible reason why a drop in organic traffic is normal, you should never dismiss the fact that your SEO campaign could be the culprit. It is advisable to work in tandem with your SEO company or in-house team to evaluate and assess the situation before pinning it on seasonality. From using Google Analytics to evaluating the PageRank, do not prematurely remove content or radically alter your marketing campaign until you have diagnosed the necessary data sets. Lastly, unless the decline occurs promptly after an update to Google’s algorithm (e.g.Penguin), it means that the drop is due to factors beyond your SEO campaign’s control. In this intensive marketing environment, it is imperative for your SEO company/team to not rest on their laurels. Never cease to relook, revamp and improve your SEO campaigns.